At the moment, there are endless bloghops/blogfests popping up all over Blogland. However, this bloghop really appeals to me because of its simplicity. One of my favourite quotes is: A journey of a thousand miles begins with a single step… meaning we should always remember and acknowledge the little things… the baby steps… so here I am! One day late! Sign up. 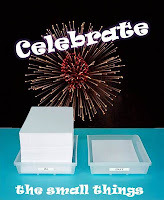 Post a small thing to celebrate, congratulate others via the linky list, and be congratulated! ~two years of blogging with a collaborative blogfest from 18-20 Feb… thanks to all those who've signed up…those who are neither here nor there, you have a month to still make up your mind… you can find out more about it here. So what are you celebrating at the moment? Please share with us! You can achieve the tech-savvy! Well done on sorting out the Kindle app and on two years of blogging, GREAT achievements! Thanks so much for joining in! Those are some great things to celebrate! Congrats on both! @Viklit ~ thanks for creating this bloghop! Secondhand Shoes is now on Kindle! Yay! @Al Diaz ~ thanks so much! Congratualtions on sorting out your kindle. I know it must be tough sorting out all the tech-savvy things, because I am not tech-savvy at all. Congratualtions with your blog's anniversary, that is definitely a big deal. As for me, I am just happy to have all the great people in my life, whether they are friends, family or blogger buddies. Good luck sorting out the techno thing! I'm with you. What am I celebrating? How about getting out of bed each morning! @Murees ~ don't worry, you'll get there one day… look at me, THE most tech-challenged person in the world, and now I can download onto Kindle… who would have thought? @Rachna ~ good luck with the rewrites… 🙂 newspaper articles..? mmm… how interesting… what type of articles do you write? I'm impressed that you're on the road to becoming tech-savvy Michelle! I love this blogfest – we should all take time to celebrate the small things. Happy Tuesday Michelle! Congrats on figuring out the Kindle app. I'm conisdering doing the blogfest, but have a ton going on that week. It sounds so fun I probably won't be able to resist as I see your badge popping up everywhere! @Kimberly ~ it's great… the little things are often the most important! I'm in awe of anyone who solves techy stuff. Well done and thanks for visitng my blog. Those are great things to celebrate. Being tech-savvy is an important skill, and what's great is you're always building on it. @Medeia ~ yes, it's an ongoing process… every day I learn something new! I scream HELP at my brother. There's my tech savvy. I'm sure he thinks I'm a moron and sometimes I do prove it. My site crashed a few months back after an update. So I send the SOS NOW HELP ME. And he asks for my FTP name and password. For an hour I sent him passwords and usernames. "No, that's not it. No, not that either." Well, we finally got it straightened out. But now I'm afraid to update anything. What if it crashes again?